This is part of a series of interviews with artists participating in #SfN14's Art of Neuroscience exhibit. 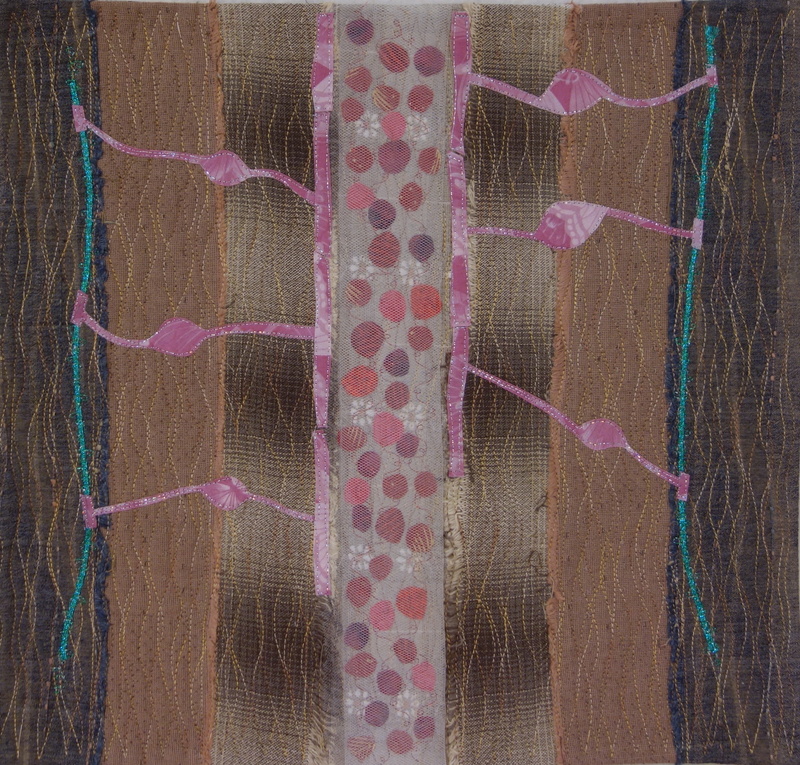 The first thing that grabbed me about Joni's brainy quilts are their playfulness. "I only use fabrics that speak to me", Joni said to me when I asked her how she constructs each individual piece. "I don't really start out shopping for fabrics with a final image in my head - I like to improvise". Instead, she picks up whatever fabric that silently catches her eye, and collects them in her studio. Thus, when inspiration strikes, she has her entire palette within reach. "In fact, I think I might've used this one in my first-ever quilt", she mused while pointing to a strip of light green cloth on an exhibition piece. Despite being largely self-taught, Joni nevertheless expertly weaves fabrics of different colors and textures into masterful abstractions of the brain. She speaks of colours fondly, almost like dear friends. "I think my favourite colour is brown" she said, while pointing at a strip of beautiful pale brown fabric, "it has so many shades to play with. It's earthy and warm." "I want my quilts to please the eye, to excite people, and make them wonder 'what is that thing'?" she comments in a blog post about her creative process, "I love questions and my process works best for me because I can stop and ask questions along the way. All I need is an initial vague idea and then the wheels can start to spin." You can find her work on the L Street Bridge between 10am to 4pm from now until Wednesday. Note that the following interview has been slightly edited for clarity. Hm, how about, if there is anything else you'd like to know about me, please come talk to me in booth 6! How did you get into your craft, in particular painting about brain-related things? I sewed casual clothes for a couple years and a friend of mine encouraged me to try quilting. In 2001, I had an opportunity to sit down and just make one, so I decided to try it out. I haven't looked back since. How do you balance scientific accuracy and artistic freedom? I *never* worry about scientific accuracy. My mantra is "inspired by science." I am not a scientist. I don't fully understand many of the structures I look at. I had an epiphany while working on different neurons. I don't know why it didn't occur to me before, because I sort of knew it, but while working on some neurons inspired by Cajal, I realized that the dendrites go in all directions. We are just seeing a cross-section. It was very exciting. I'd love to explore that element more. How do you choose your color scheme and ways of abstraction in your depiction of the brain? If I'm using a scientific image, I'm usually inspired by the colors in that picture, even if I might flip colors around. I always start by making a "base", as I call it, and sometimes I'll make a base with no specific image in mind. Later, I might see something or someone will say something that triggers an idea and I can go back to the base I made. Sometimes ideas come to me as I'm working on a base. For instance, The Brainey Deep base was kind of an accident. I wanted to make a purple base and I pulled out so many fabrics, I ended up making two small purple bases and the pink base for The Brainey Deep. After the base was done, I looked at it and thought, aha, brain! And then other times I will use color schemes that I know are popular in the quilting world, like blue and yellow or red and black. Are there specific (neuro)scientific themes that you explore in your art work? If so, what are they? In terms of themes, I seem to be drawn to the sea, deep space, and microscopic images (although Immy Smith @DrImmySmith is getting me interested in fungi, lichens, and moths too). I am fascinated by the fact that we see the same patterns at every scale. Neurons look like cities look like galaxies. Neurons look like lightning. You get the idea. I like making connections that aren't obvious to everyone. I am currently playing with the idea that the universe is a brain and stars and galaxies are neurons and that the ocean is a brain and jellyfish are neurons. But I like to play with lots of ideas. There often seems to be a divide between the arts and the sciences - how does science contribute to your artistic inspiration and/or creativity? I dropped out the sciences in college, which was somewhat sad to me, so the thing I'm finding most exciting about being in the #SciArt world right now is that there is all this cool science out there and I get to learn about it, but I don't have to be tested on it. I can take the bits I find most exciting and turn it into art. I don't know that #SciArt will get more people interested in science, but it is my hope that it will. As an artist, what fascinates you most about the brain? That big chunks can be missing and a personal can be functional. Or even little teeny chunks can be missing (on the molecular level) and things are ok.
What's your favorite piece of work so far, and can you tell us more about it? I think my favorite piece so far is the Blood Brain Barrier I made. I had had a rough week and I was musing on bubbles because I had read something about using bubbles to get through the Blood Brain Barrier. I went to check that fact out and found this amazing image by Ben Brahim Mohammed. I flipped the perspective a little bit and was really pleased with the effect. Also, I used a background that has these great Japanese fabrics and I was trying to figure out something I could put on it that wouldn't hide the fabrics or compete with it. Thanks for asking! [Etsy store] and while we're all gathered for SfN 2014, you can find me and six other artists on the L Street Bridge between the two buildings of the Convention Center from November 15-19. I'll also be showing some work at the NIH Clinical Center from January-March 2015. Is there anything else that you'd like to talk about relating to art of neuroscience? The best place to find my work is [my home page]. It's got links to galleries on Picasa [SF: and Pinterest] where almost all my previous work is posted. Also, I tweet works in progress @artcollisions. Thanks Joni for taking the time to talk to me! To get the full effect out of her work, please go check them out in person - the use of different textures brings out an additional artistic layer that's hard to capture with images. Next up is H Kathleen Childress, talking about how neuroscience inspires her hand-made jewellery.